By Angie Drobnic Holan on Tuesday, January 9th, 2018 at 1:21 p.m.
Is it accurate? Many details are simply wrong. Whether the larger narrative is true is a different question. • Wolff said then-Speaker of the House John Boehner resigned in 2011; it was actually 2015. • Wolff said Trump didn’t know who Boehner was in 2016 ("Who’s that? "), even though Trump tweeted about Boehner’s reputation for crying in 2015. • Wolff said Wilbur Ross was Trump’s choice for labor secretary; it was actually commerce secretary. • Wolff misspelled the name of Democratic strategist Hilary Rosen (not "Hillary Rosen"). • There are many typos, as well as wrong word choices ("pubic" instead of public; a dream "differed" instead of deferred). • Wolff reported that Washington Post reporter Mark Berman was at a Four Seasons breakfast when it was likely another person named Mike Berman. • Wolff writes that the infamous Steele dossier, a private compendium of Trump’s history with Russia, suggested that Trump was being blackmailed by Russia. A more restrained interpretation of the dossier suggests Trump could be subject to blackmail, but not that he was the actual victim of it. A bigger problem with Fire and Fury, however, is that by any standard of sound journalism it has big problems with transparency and sourcing. One of the book’s major storylines is a fight to the political death between Trump adviser Steve Bannon and Trump’s family — most specifically daughter Ivanka and son-in-law Jared Kushner. Each team fights for influence with the president and attacks their rivals through leaks to the press and outright insults of each other to anyone who would listen. "In the Oval Office, in front of her father, Bannon openly attacked (Ivanka Trump). ‘You,’ he said, pointing at her as the president watched, ‘are a f------ liar.’ Ivanka’s bitter complaints to her father, which in the past would have diminished Bannon, were now met by a hands-off Trump: ‘I told you this is a tough town, baby.’ "
How does Wolff know this scene happened? We don’t know. Was he there? It’s not clear. Did Bannon tell him? Did Ivanka Trump tell him? Did President Trump tell him? There’s no way to know, and many scenes in the book are like this. Wolff writes in the book’s introduction that he conducted interviews with more than 200 people and that he was able to enter the White House often, apparently allowed in to observe because nobody was savvy enough to bar him. Certainly one of Wolff’s sources is Bannon; Bannon is quoted extensively in the text and most of the drama seems to revolve around Bannon’s attempts to keep Trump pure, i.e. not moderate his politics, and make liberals as angry as possible. It also seems likely Wolff spoke with other advisers like Kellyanne Conway and Katie Walsh directly. After that it gets hazy. Did he interview Jared Kushner and Ivanka Trump? They are seldom quoted directly, though Wolff claims to know their motivations and personal insecurities. Wolff describes Kushner’s internal thoughts when Kushner watched Bannon in a high-profile 2016 appearance at CPAC, a conservative conference: "Thin-skinned, defensive, on guard, (Kushner) perceived Bannon’s speech as a message sent directly to him. Bannon has just credited the Trump victory to everybody else. Kushner was certain he was being taunted." Wolff has resisted detailed questions about his sources and has instead emphasized multiple interviews and his many visits to the White House. 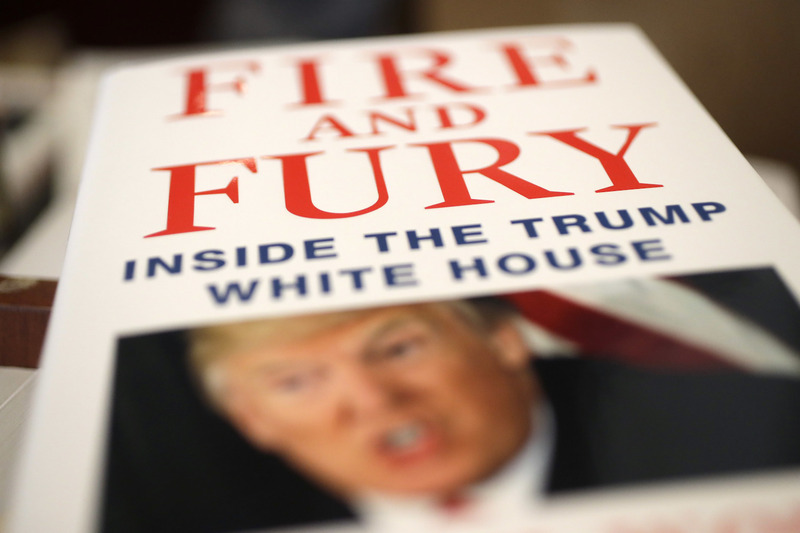 "The real intention of this book is to have readers sit with me on the couch and watch what’s going on in the West Wing," Wolff said on Meet the Press in response to questions on sourcing from host Chuck Todd. "I went into this with absolutely no agenda whatsoever. I have no particular politics when it comes to Donald Trump. This is really all about human nature." The fly-on-the-wall, you-are-here atmosphere that pervades Fire and Fury will undoubtedly sell books. But like other books before it — the 2010 political book Game Change comes to mind — Fire and Fury hardly seems a move in the right direction for well-sourced, evidence-based journalism. Instead it’s a stew of mysteriously sourced dramatic scenes. The people who take time to read the book for themselves will find a devastating portrait of Donald Trump. Trump is portrayed as totally out to lunch, with such a short attention span that he’s incapable of reading policy briefs much less of analyzing a problem or making a well-informed decision. Trump is shown constantly watching cable TV, frustrated and confused by the fact that he doesn’t receive widespread approval. His staff is well aware of his shortcomings and wonders just how long they can continue the illusion that Trump is capable of governing. The book’s depiction of the reasons behind the firing of FBI director James Comey is particularly brutal. In the book's telling, Trump fires Comey because his family is terrified Comey’s investigation of Russia will lead to investigations of the Trump and Kushner family finances. And though Wolff’s sourcing for this isn’t exactly explicit, the idea is actually supported by an on-the-record interview Trump gave to the New York Times in which he said special counsel Robert Mueller should stay away from his family’s finances and keep the investigation confined to Russia. Bannon’s take on this is operatic, detailed and one of the most fascinating passages of the book: " ‘Ehhh … ehhh ...ehhh!’ screeched Bannon, making the sound of an emergency alarm. ‘Don’t look here! Let’s tell the prosecutor what not to look at!’ " Bannon then gives an extended riff on Trump’s vulnerability to the Mueller investigation, the professional backgrounds of the prosecutors, the exposure of Trump’s family and Trump’s own risk of being removed from office. "They’re sitting on a beach trying to stop a Category Five," Bannon concludes. It’s scenes like this that have driven Bannon to issue something of a mea culpa. He recently apologized specifically for his criticism in the book of Trump’s son Donald Jr. for taking a meeting with Russian nationals; he also stepped down from his post as executive chairman of Breitbart News. Trump on Twitter has derided the book as boring and untrue and promoted himself as a "stable genius." And the White House team has taken to cable to attack Wolff and defend the president’s competence. Like much of the Trump presidency, battles over political power seem to go hand in hand with battles over the nature of ultimate truth. Whether the big picture shown in Wolff’s book is accurate will be answered as time passes and the Trump presidency unfolds. "John Boehner had been the Speaker of the House until he was forced out in a Tea Party putsch in 2011"